Some of the churches and colleges in Northern California. The California religious climate in the 1840's was overwhelmingly Roman Catholic. Missionaries had moved up from the south, establishing missions and making Catholic disciples. That all changed when gold was discovered. While it is true that people came from all over the world to mine for gold in California, in the first five years the majority of immigrants came from the midwestern states of Ohio, Indiana, Illinois, Kentucky, Tennessee, Missouri and Iowa. Coincidentally, these were the very states that formed the heartland of the Campbell-Stone movement to restore New Testament Christianity. Christians came and churches began appearing. Some of those are chronicled on this page. We have searched for photos and drawings of early church buildings, but those who have preserved this segment of history have tried to put their best buildings forward, so graphics of the older buildings have been largely disgarded. In 1857, the Christian Church was built in the little town of Liberty, 1.5 miles south of Galt, near Liberty Cemetery. The original church was constructed of lumber that came round the Horn. It had a square Gothic bell tower. Later, it was moved into Galt proper and placed at the corner of 7th and B Streets, across from the power substation, where it remains. Over the years, a basement was added and the bell tower removed, probably because it leaked. The ground floor is currently Rosa De Saron, a Spanish language church. The basement is rented to a charter school for high school credit. Early members included such names as Allport Briggs, Fuga, Chism Cooper Fugitt (founder of the town of Liberty), Hunt, and Smithson. .
the Robert N. Dennis Collection. W.W. Stevenson, a scholar, a writer and a good speaker came to Stockton from Arkansas in � seeking a place to regain his health. He was a Disciple, well-informed on New Testament teachings. These Disciples soon became acquainted in this small community, meeting together for Christian fellowship in a small house on the corner of San Joaquin and Weber Streets in 1849 and �. Thomas Thompson, a preacher from Kentucky, with his family, arrived in California in � by prairie schooner, stopping at Gold Run in Placer County. Moving to Coloma on the American River where the gold was first discovered, in 1850, he operated a hotel for miners and preached to the people. In the winter of �, Thompson moved his family down to Santa Clara, buying a piece of ground on the edge of this small town. The spring of 1851 found Thompson on his way back to Coloma to look after his property. Late in the summer, he visited different places on his way back to Santa Clara. Stopping in Stockton, he inquired about the Disciples of Christ, and visited them in their homes. Believing in Church organization and evangelism, he urged them to organize a church. On August 24, 1851 they were called together in a small house on the corner of San Joaquin and Weber Streets. The location was the home of J. D. Green. Early members included such names as John Crawford, J. W. Glasford, J. D. Green, Lidian Green Jane Gard, Mahala Gard, Lidian Green, Isaac Hitchcock, Joshua Hitchcock, Margaret Hitchcock, Silas Hitchcock, Frances Maxwell, Thomas Maxwell, Ellen McLain, S.M. McLain, Louise Perkins, Lucy Ann Rife, J.W. Smith, Mahala Smith, W. W. Stevenson, Lucy Whiton, and John Woodrome. Sutter is a few miles west of Yuba City. A Christian Church is shown on the Sanborn Fire Map of 1914, the earliest available. It was almost certainly estabished by Levi J. Todd, son of pioneer preacher Abbott Levi Todd of the Roseburg area of Oregon. The building was located at Acacia and Lyon, in the southwest corner of the intersection, one block north of the Methodist Church. It was a simple rectangular building with a bell tower at the corner closest to the intersection. All that remained in 1928 was the concrete foundation. The 1910 U.S. Census shows Mr. Todd being married to Etta M. Todd and their children were Leo R., Emery S. and Ramons. Several family members are buried in the Sutter Cemetery, indicating that the family stayed in the area for some years. There is no local memory of the building or the church that met there. (This writer lived there for three years.) Historian E.B. Ware does not mention the Sutter church in his history, so we conclude that the congregation stayed to itself and did not interact much with others. In the fall of 1854 Joshua Lawson led a worship service under an oak tree on which is now Clanton Avenue here in Woodland. Soon after that service the Christian Church of Woodland was organized with twenty-seven members, most of who had come to the area in ox-drawn covered wagons that very year. The same year a teacher/lawyer/preacher named John N. Pendegast arrived in California with his wife and five children after a harrowing journey from Kentucky, a journey on which John was seriously injured when Indians stampeded their wagon train. He was thrown from the wagon sustaining head injuries, a severely broken arm, crushed elbow and bruised hip. They arrived in California destitute, but as soon as Joshua Lawson heard that Pendegast had arrived in the state he urged him to come and preach a protracted meeting. Pendegast not only preached that meeting, but settled in Woodland with his family. Under the visionary leadership of Joshua Lawson and J. N. Pendegast the Christian Church of Woodland grew to become, between the years of 1855 and 1880, the largest and most influential congregation of the Christian Church in the state. The congregation has served in many creative ways over the years. In 1861, out of concern for the education of young people, the church founded Hesperian College. Douglas Junior High School stands on what was once the college campus, and College Street is so named because the college was located on the south end of the street. In its early years the Woodland Christian Church also played a part in the establishment of congregations in Vacaville, Buckeye Flat, Knights Landing, Madison, Capay, Winters, and Sacramento. An official history of Yolo County says, "The Church of Christ" (an early name for the Woodland Christian Church) is the spiritual organization upon which the people of early Woodland depended. It can safely be said that from the strength of this church the culture of Woodland and of Yolo County took shape." 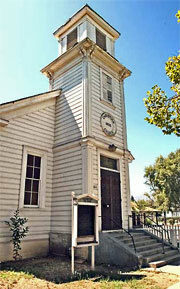 The Christian Church of Vacaville was founded on October 4, 1854 and is Vacaville's oldest continuously meeting church. The first meetings were held in a school house on Arculus Hawkins ranch. 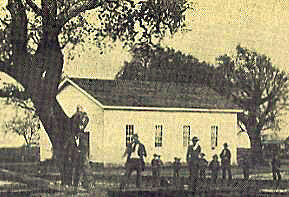 They soon outgrew the school and a church was built on the banks of Alamo Creek at the edge of Oiler's Gum Grove. A large pool was dug and the creek waters were used for baptisms. Today this is the location of Eleanor Nelson Park. As the congregation grew, it was decided that a new church should be built in Elmira for the 47 members living there and in 1872 the first services were held in the new building at the corner of First and Hazen Streets. The Oiler's Grove building was placed on log rollers and horses towed the building to its new location on Catherine Street in Vacaville. After moving the church to Vacaville the congregation grew to 222 members by 1880 and plans were begun for a new church home. It would take until 1891 before the enormous sum of $6,780.35 had been pledged to cover the costs and a contract was awarded to George H. Sharpe calling for completion in 90 days. The Disciples in California built a very large tabernacle at Santa Cruz that was a state-wide gathering place, much like the Turner Tabernacle in Oregon. We have mounted the photo on a separate page so the Tabernacle could be shown larger. Pierce Christian College was named after Andrew Peirce (Pierce), a pioneer of 1849. Securing 3,000 acres 35 miles north of Woodland, he heard the message of Christ preached in the local school house. A church was established and Andrew Peirce was a part of it. He was very generous, donating land for a cemetery, for a church building and a public school. Following his passing, a Board of Trustees was established and the town of College City was laid out. The college was located on 9th Street, near Main. W. J. Carpenter of Iowa, a preacher among the Christian Churches, was selected to develop the property. J. Durham became the first president of Pierce Christian College, followed by J. C. Keith, who remained fourteen years. For years, this was the only school of higher education in this part of California. Tuition was $3 per month. At one time, most of the teachers of Colusa County were educated here. The college opened in 1874 and closed in 1897. College City is east of Arbuckle in Colusa County. Mr. Peirce was a shoemaker by trade and came to California from Massachusetts. He was engaged in ox-team freighting between Sacramento and Shasta for some years. He began raising and selling purebred breeding rams. He died at the age of 48. -- from a City of Woodland marker. 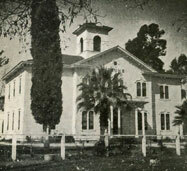 Hesperian College in Woodland began classes on March 4, 1861, timed to coincide with the exact hour of President Abraham Lincoln's inauguration. Its founding principle was a dedication to Lincoln's belief in equality in education. To that end, Hesperian admitted students of both sexes and all races � a radical educational concept at that time. The school was established by J. N. Pendegast and J. Lawson. The school became known as the "Bethany of California," a reference to Alexander Campbell's Bethany College in Bethany, West Virginia. It has served as a model for the Hesperian founders. At one point, the new school had 120 students. As state-funded education became available, the enrollment diminished. The school closed in 1895 with assets eventually being transferred to present-day Chapman University. 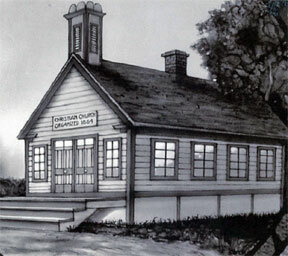 A small public school was built near what is now known as College City and A.W. DeWitt was asked to conduct a gospel meeting there accompanied by singer B. S. Gardner and wife. Out of the meeting came a church and into the church came wealthy landowner Andrew Peirce (Pierce). When he passed away in 1871, he had left provisions for funding a church building and a college. Both the church building and the college building were located on Main Street, just south of 9th. The church building had two towers in front, one was a belfrey and the other a spire. This building was moved to 5th Street. Twelve families of overlanders settled near Santa Rosa and begain worshipping together. They first located their meeting near the present-day Montgomery Village Shopping Center. This was 1854. By 1857, a church house was built on "B" Street in developing Santa Rosa and later moved to 429 5th. It shows on the 1885 fire map at that location. Some groups opposed using church spires and this may have been one. Two founding preachers were Thomas Thompson and John McCorkle. Both men were based in Santa Rosa, but also planted churches in the area. Santa Rosa Christian College opened in 1872 with 80 students, but closed after six years. This church was first organized at Gilroy,in the month of March, 1855, by Thomas Thompson, John P. McCorkle and James K. Rule, who were the first officiating elders. The members were Massey Thomas and wife, George Anson, David Lillare and wife, Stephen W. Withers, Milton T. Holsclaw, and James Holsclaw. The first meetings were held in the old school-house, near the present church, which was erected in 1857. The old building is still in use at 160 5th Street. It is on the U.S. National Register of Historic Places. Historian E.B. Ware believes this was the first building among the Disciples in California. L.M. Jones was the minister in 1895. He had moved here from Central Point, Oregon. The building shown was constructed about 1900 and is still in use today. The first congregation may have been east across the Sacramento River in the Antelope community. It was established by A.W. DeWitt sometime in the early 1860s. Later, a congregation was established in Red Bluff proper and the two were merged. 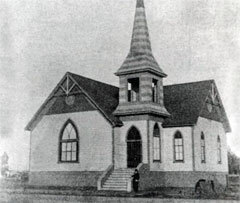 The Red Bluff congregation was established by the preaching of James Logan in 1881. He was a warm and generous man, loved the work of the ministry and could tell the story well. E. B. Ware reports that Logan at one time was a clown in a traveling circus. The Christian Church, one of Red Bluff抯 oldest churches, began January 23, 1881. Twenty-four members came together to organize the congregation incorporated as The Christian Church. Samuel Alvord and P. K. Singleton served as the first two elders. In the early years, services were held in a little chapel on Madison, two lots north of the present building. The chapel was finished March 4, 1881, and dedicated on June 1, 1884 at a total cost of $1,500. The lots for the present building, located at 926 Madison, were purchased in 1891, and a building fund was started with a bequest of $1,000 from the T. R. Cone estate. Construction began in 1899 and was finished in 1900 at a cost of $6,000. Many of the original features and furnishings have been preserved and are in use today. The building itself came as a prefabricated home kit, very popular at the turn of the century. It was ordered from a Sears抯 catalogue and shipped around South America, then hauled by rail car up to Red Bluff from San Francisco. The pulpit, communion table and two chairs, still in use, were handmade by Frank Hamilton who worked at Sierra Pacific Lumber Mill. Large wooden rolling doors are concealed in the ceiling surrounding the worship area. They can be lowered or raised to change the size of the main auditorium as needed. Originally the building was lit with gas lamps. Several of these fixtures still exist. The pump organ first used in services at the little chapel can still be played for special events. Until 1910 the elders of the church conducted the services and preached. As with most things, the original vision and simplicity of the Christian Church denomination wandered and wavered over the years. In 1991, due to a number of factors, the membership in Red Bluff voted to leave the denomination and became an independent, non-denominational church. 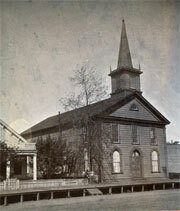 The First Christian Church of Sacramento was organized in 1865 by Thomas Thompson with 14 members. Among the charter members were J.O. Garrett, A. Hitte and J. Farnsworth. The church met in private homes for nearly 20 years. J. N. Pendergast helped in the purchase of a lot and building on 8th, between N and O Streets. Then, a larger building was acquired on 16th between L and M Streets. After this was destroyed by fire, a brick building was built at 27th and N. This is the first church this writer ever attended!